Damascus (dpa) – The Syrian government announced on Tuesday that it will adopt an anti-smoking law “to protect people from the negative consequences of smoking on health, economy and environment”. The law prevents smoking in public places and prohibits advertising of all tobacco products, reported the Syrian official news agency SANA. Local statistics indicated that smokers represented 15 per cent of the population, or three million Syrians, with an average of one cigarette pack smoked a day. Syrian smokers spend about 26 billion Syrian pounds (about 562 million dollars), on smoking, and each smoker spends around 8 per cent of yearly income on the habit. Will the government ban include a ban on Argeeleh smoking? Decision will probably be quite unpopular with smokers. I’m very impressed. I know this will be a very unpopular decision. Glad they decided to go for it. Look at the amount of smoke coming out of that argeeleh in the picture above! If the ban included argeeleh, half of the country’s coffee shops (and many restaurents) will go out of business. Middle Easterners can spend 30 minutes drinking one of those, instead of smoking argeeleh. بحث مجلس الوزراء في جلسته التي عقدها اليوم برئاسة المهندس محمد ناجي عطري رئيس المجلس عددا من القضايا والموضوعات التنموية والخدمية والية تتبع تنفيذها بما يوازن بين المواصفات الفنية وتحقيق الجدوى الاقتصادية. وطلب المهندس عطري خلال الاجتماع من الوزارات والجهات العامة اتخاذ كافة الاجراءات الكفيلة بترشيد عمليات الانفاق الجاري في موازناتها لعام 2009 مشددا على ضرورة تدقيق التكاليف المالية للمشاريع المعتمدة قبل الاعلان عن تنفيذها والتعاقد عليها بهدف الحد من الانفاق الزائد وغير الضروري الذي تتحمله بعض هذه المشاريع ولا يؤثر على اداء وعمل هذه المشاريع ووظائفها الاساسية. بعد ذلك بحث مجلس الوزراء مشروعات القوانين والمراسيم المدرجة على جدول اعماله واقر منها:. مشروع قانون مكافحة التدخين وذلك بهدف حماية المواطنين من العواقب والاضرار الصحية والاقتصادية والبيئية الناجمة عن آفة التدخين . وقد راعى مشروع القانون شمول جميع منتجات التبغ باحكام هذا القانون وتحديد مسؤولية كل جهة من الجهات المعنية بمكافحة التدخين ومنعه في الاماكن العامة ومنع الاعلان عنه وعن منتجاته وعن الادوات المتعلقة باستعماله. Which means .. argeeleh too! But we still do not know what “outdoors” means. Probably not in Cafes or restaurants. The Prime Minister/leadership must have seen your first picture above and decided to act. This gentleman is clearly a pro and undoubtedly a health risk. Can you imagine having dinner or sipping coffee at the adjacant table? Alex, you are SUCH a nerd! I find the claim that “smokers represented 15 per cent of the population, or three million Syrians, with an average of one cigarette pack smoked a day” highly improbable. Anecdotal evidence would suggest that number to be almost half of the population. The press release states that smoking is prohibited in “public places” (al-amaakin al-‘aamah), which doesn’t make it clear if, for example, restaurants and cafes are included, although in general they would fall under that category. Could you imagine Nawfara without arghileh or Ma’ha Havana without cigarette-smoking old intellectuals? But of course, the khalijis will get “special dispensation” when they come in summer, or int’l hotels will be exempted and Bludan declared a “smokers zone”. I totally agree … there is no way it is 15% only, especially when you count Argeeleh smokers. And I have no idea how they plan to enforce the ban … we will have to see. I assume it will be very difficult .. that’s why I wrote that it will be a very unpopular decision. But I would like to think that this is one of a number of decisions that many of us were hoping to materialize for the past couple of years … they were all the obviously necessary, but risky types… like this one. Anyway .. for now we can at least count on the ban on advertising for tobacco products. That part of the new law is clear enough and should be easy enough to enforce. Yes, the ban on tobacco ads is easy to enforce and the only people hurt are a few ad companies. As for the ban, we’ll have to see what it will mean in reality and which “public places” are actually meant. And banning arghileh is just wrong! Didn’t the cabinet, in its decision, state that places such as restaurants could have limited smoking zones within their premises? That would probably allow these places some room to maneuver. It is definitely going to be a very unpopular decision, as Syrians, like most other middle easterners, love to smoke while engaging in other activities, such as eating or drinking. Nour … where did you see that? .. the only information I have is what’s above. I doubt they’ll ban the argileh. Australia has public smoking bans, but permits argileh cafes/salons. Great decision though. Surprising from Syria, where you’d think the priority would be economic reforms. I take it Bashar isn’t much of a smoker? Two-thirds of Palestinians support a plan that offers Israel full recognition from the Arab world in return for withdrawing from occupied territory, and nearly two-thirds of Israelis oppose it, according to a survey released Tuesday. The poll also indicated that a majority of Israelis and Palestinians support an extension of a truce between Israel and Gaza’s Hamas rulers. The truce, which has become increasingly shaky in recent weeks, expires on Friday. According to the survey, 61 percent of Israelis oppose the trade-off and 36 percent support it. Among Palestinians, 66 percent support the idea and 30 percent oppose it. The poll showed there’s greater support among Israelis for a proposal that would see Israel withdraw from the West Bank and Gaza but keep some Israeli settlements in less than 3 percent of the West Bank. That land would be swapped for an equal amount of Israeli territory. That is the general framework discussed in peace talks in the 1990s and again since negotiations have been renewed over the past year. Forty-six percent of Israelis support and 48 percent oppose that plan. Among Palestinians, 54 percent back the plan and 44 percent oppose it. The poll also indicates that 49 percent of Israelis and 57 percent of Palestinians want U.S. President-elect Barack Obama to become more involved in solving their conflict. I suspect that the 15% figure is low- given that around 40% of the population is under 15, if half the adult population smokes, that would represent about 30% of the population. A major benefit that may not get much attention is the saving for the Government on the potential costs of providing health care for smoking-related diseases. If allowed to go unchecked, this could become a major financial burden. I think that the Prime Minister misspoke. I am sure that he meant to say that 15% of the Syrian population does not smoke and 85% do. I don’t know about cigarettes, but Bashar does smoke Argelih. I think Syria is courageous to ban smoking but i think it would be better if they increase the taxes on tobacco products and let the owners of the public places like restaurants and cafes decide if they want to have smoking there or a smoke free places . People who smoke will die from heart disease , cancer and strokes , people who do not smoke will die from Alzheimer after many years of being dependent on their families , I do not know which is more merciful. I think the ban does include argeeleh. It says smoking (in all forms). Are Downtown areas considered “public places”? Because as far as Japan goes, you can smoke inside almost all cafes/bars/restaurants, but not on the street! This is definitely a good move, nonetheless, I know a few people who will not be very impressed. If the White House wants to convince us that the Arab nations are united in wanting to halt Iran’s nuclear program, they need a new ’spinmeister” in the chair. The six powerful members of the UN – the U.S., Russia, China, Britain, France and Germany – wheeled out the usual Arab nations today to support their Iranian policies. The Arab nations were “represented” by the usual US Arab allies namely, Bahrain, Egypt, Jordan, Kuwait, Iraq, the United Arab Emirates and Saudi Arabia. In what was meant to be a convincing statement the barely US Secretary of State, Condoleezza Rice said “All there expressed their concern about Iran’s nuclear policies and its regional ambitions.” These are the Arab nations most aligned with the US, these are the US allies in region and this statement will not convince the most minimally informed Western analyst, let alone the other Arab nations. Where was Syria, Yemen, Qatar and the rest? Seriously, the White House needs a a new strategist, because this was a weak sell even by the low standards of the departing Bush Administration. The US, in its current approach, has lost the impetus it could have had in the Iranian situation by isolating the parties that could act as a real go between. Iran is not going to listen to the six nations that Rice presented. Had the US, like many European nations, been willing to deal with Syria as opposed to isolating them, the pressure on Iran might have had a chance. Had, Heavens forbid, the US under a Bush Administration found a way, directly or indirectly, to deal with Iran, a non-military resolution with Iran may have been possible. There are a few jobs becoming available in the Administration over the next few weeks, and a new Middle East strategist, PR person, and negotiator should be top of the priorities. In dealing with the Middle East you are not dealing with the US media, you are dealing with hardened regimes with an in-depth knowledge of the regional politics. Trotting out Bahrain, Egypt, Jordan, Kuwait, Iraq, the United Arab Emirates and Saudi Arabia won’t work for us observers of the region, let alone the powers there. We can see the advertisement now, “Wanted, an person who knows the Middle East, can relate to both Muslim and US cultures, not afraid of hard work, used to little reward or praise and able to start immediately.” Even in this economy, there might be few takers. “people who do not smoke will die from Alzheimer after many years of being dependent on their families”?? The way Syrians are smoking (especially argeeleh that equals 100 cigarettes) they will die much younger than the Alzheimer age. And you probably know that only one in eight people over 65 have Alzheimer. The article you mentioned above seems a bit confusing and laid with a few contradictions. On the one hand, it claims, 61% of Israelis oppose the Arab Initiative. On the other, 48% support withdrawing from 97% of the West Bank. How does that work out, except if we consider the problem as being the return of the Golan? But the article talks purely about the West Bank. I think someone there is confusing things. If anything, if 61% is the actual figure, then we’re making headway (!) not moving back. Because the only logical explanation for the lack of support for the Arab Initiative is the Golan. Most Israelis (although they claim just under 50%) still understand and have already accepted that a Palestine must be created on near-total territory of the West Bank and Gaza. And, indeed as I mentioned earlier, they are also willing to transfer territory inside Israel in return for keeping Ariel, Ma’ale Adumim, and Qiryat Arba. Polls should not be taken during election campaigns, because people’s views change almost daily, based on how good a particular candidate looked that morning on TV, and what empty promises he/she made. The error during campaigns should be much greater. I think you might be right about the Golan being the cause of the 13% difference in support. But it might also be the 3% of the Palestinian occupied territories that Israel would be allowed to keep where large settlements are present. An average argeelah has the same tar & nicotine content of about 4-5 cigarette packs. So if they will not ban argeelah smoking then they are idiots. I am sure concerned businesses will get away with it by putting argeelehs outdoors but if inforced right even that will mean a limit on smoking in the winter. In addition to the Golan, it may also be the refugees and Jerusalem that scares Isrealis in the Arab peace plan. i.e., maybe they think that the 3% are in addition to Jerusalem or include Jerusalem and maybe they think that by giving up 97% of the land the refugee problem will be declared solved. I think also that the set of Arab peace plan supporters does not include properly all Syria-peace supporters, i.e., there may be folks who are willing to return the Golan but are not willing to give up Jerusalem or openning up the refugees question. do not worry guys, in most cases laws in Syria are never put to practice. I understand why the goverment wants to ban smoking for health reasons , but the amount of pollution in Dmascus isn,t because of smoking its becauSE of the use of MAZOTE. Its used for heating and transport and it absolutely filthy, if the goverment wants to solve a pollution problem it needs to make a”clean air act” which happened in Britain years ago . The man smoking the argeelah in the picture looks like he might be one of the Nari s, these are the men who start off the argeelah for the customers in the cafes. A clean mouthpiece is given BUT, what about the smoking tube? Its used and used by the customers ..there could be all sorts of microbes lurking inside …I know people who take their own smoking tube to a cafe when they want a smoke, I dont smoke but I like the smell of argeelahs . Recently I was visiting San Diego and smelt the familiar smell of apple argeelah , I thought I was having an hallucination, but there on the sidewalk in la holla were young Americans enjoying the argeelah ! Thanks to the fact that Argeelah is “used and used by the customers”, people in the know report a jump in Tuberculosis cases in the country. The smart ones are having to bring their own Argeelah to their favourite restaurent/coffee shop. JERUSALEM (Reuters) – Israel’s strategic focus in 2009 will be on Iran’s nuclear plans, on Syria and, to a lesser extent, on Lebanon, arenas where the arrival of the Obama administration in Washington may prompt shifts in tactics. But the nearer-term risks next year for both Israelis and the Palestinians lie a lot closer to home, where not only could fighting increase between Israelis and Palestinians but where risks have risen of internecine bloodshed inside each camp. Deep ideological fissures on both sides make for an exponentially greater risk of violent conflict, analysts say, who also note the uncertainties of an Israeli election in February as well as uncertainties about new U.S. policies. For Palestinians, much of the focus of potential violence remains their internal split, between Hamas Islamists who rule the Gaza Strip and President Mahmoud Abbas’s Western-backed Fatah, which holds sway in the Israeli-occupied West Bank. Israelis, disillusioned with or hostile to negotiations predicated on ceding occupied land to a Palestinian state which could coexist with the Jewish state, look likely to re-elect hawkish ex-premier Benjamin Netanyahu in a Feb. 10 ballot — effectively voting out Washington’s current vision for peace. Further afield, Israel, which is assumed to have its own nuclear arsenal, rejects Iran’s insistence that its nuclear programme is not a bid for weapons to threaten the Jewish state. Israeli leaders want Barack Obama to keep up pressure on Tehran. They are also pursuing peace talks with Syria and hoping for more U.S. engagement on a strategy to weaken Damascus’s ties to Iran and its support for Lebanon’s Hezbollah, and for Hamas. But in terms of Israeli-Palestinian negotiations, the diplomatic stasis is raising the risk of open conflict. Many analysts point to tinderbox Gaza, across whose border Islamist guerrillas and Israeli forces have been trading fire despite a six-month-old truce that formally ends this week. Israel is in no rush to invade the impoverished coastal strip, but that mood would quickly change were the Palestinians to inflict heavy civilian casualties — say, with an improvised rocket from Gaza that hit a school or other large group. Such an attack could “wreck the calm and lead to escalation,” said the Israeli military intelligence commander, Major-General Amos Yadlin. The losses attendant on a Gaza offensive could draw a resumption of Hamas suicide bombings in Israel. But there could also be an effect in the West Bank, where Hamas loyalists accuse Abbas’s administration of siding with Israel against them. “If there were an uprising in the West Bank, it would be against the Palestinian Authority security services, which are collaborating with the Zionist occupier,” said Mushir al-Masri, a Hamas official in the Gaza Strip. Beholden to the international donors who also support his security forces, Abbas is unlikely to abandon rapprochement with Israel — let alone opt to fight it — however frustrated he may be at the lack of progress toward a Palestinian statehood deal. But pressure on Abbas to shift course could mount should a recent rash of rampages by Jewish settlers in the West Bank against Palestinians turn deadly, especially given views the Israeli state treats its ultranationalist fringe too leniently. Michael Oren, a military historian with the Shalem Centre in Jerusalem, said Israel would be forced to confront the radical settlers should its troops become victims of their violence. When i was there most Syrian women did not smoke , that might give away my age. In this crucial political debate, I have to support MS. My experience is that huge numbers of Syrian women smoke. More conservative women do not smoke in public, but they still smoke. The last time i was in Syria was 2003 and before that was 1987,and at that time my younger female relative were smoking sometime Argelas but not on a wide scale and only when they are out , I guess i still look at what my mother did and make a generalization. Contrary to a claim that smokers got AD at a younger age, there was no difference in men. Female smokers were younger among both cases and controls, which proved it to be spurious. Over 4 million people suffer from AD, and annual costs are over $88 billion. There may be 73,000 excess cases per year among non-smokers, with $17.5 billion in excess costs. Israel and Syria have both told Turkey that they are not currently interested in conducting another round of indirect talks with each other, an Israeli diplomat told Haaretz this week. The diplomat said Damascus and Jerusalem explained that they are suspending the Turkish mediation in peace negotiations because talks would be pointless before Israel’s general election on February 10. Turkish officials said they believed talks would be resumed after Israel gets its new leader. The decision to shelve the process did not invoke much protest from the Foreign Ministry, where top diplomats have said they are unhappy with the way peace talks have allowed Syria to break out of its isolation, despite its classification as a terror-sponsoring country. This problem reached new levels when the European Commission issued a draft early this month for updating its free trade agreement with Syria, which had been suspended for several years. The signing of a final free trade deal will not happen any time soon, but the draft represents a significant achievement for Damascus. Meanwhile, quoting sources familiar with the talks, Reuters reported that Syria has drafted a document defining the boundaries of the occupied Golan Heights and was waiting for an Israeli reply through Turkish mediators. This could mean that negotiations will continue even if the fifth round of talks does not happen. The document is an addition to a Syrian peace proposal which, as Haaretz reported in October, refers to six contested points whose resolution, according to Syria, could help seal a peace deal as early as next year. The addition is in fact a map outlining a future international border. A Syrian official said the paper sent to Turkey includes reference to geographic points on the present northeastern shore of Lake Kinneret. “The document puts us on the water,” the official said. Hafez Assad, Syria’s previous leader, regarded the northeastern shore as an integral part of the Golan and said Syria controlled it before the war broke out on June 4, 1967. Syrian Vice President Farouq al-Shara said last month that “the Syrian definition of the June 4 line means the restoration of the northeastern shore of the lake to Syria” and described Israeli arguments about the shoreline receding as invalid. Diplomats in the Syrian capital said that even if the two sides make progress on the territorial question a deal might not follow easily because Israel now wants Syria to reduce its alliance with Iran and cut support for the Lebanese Shi’ite movement Hezbollah and Palestinian Islamist groups. “The situation is more complicated than in 2000 with Syria’s external ties coming into play. Syria also wants agreement on the six points without direct negotiations, which might be difficult,” one of the diplomats said. Syrian officials have said Israel has no right to set conditions regarding its foreign policy but acknowledged that the political map of the region would change if Damascus and Israel sign a deal. Bashar Assad, Syria’s president, told Western visitors that Syria had received a document from Israel through Turkey with queries about Syrian relations with neighboring states after a possible peace, the visitors say. “The president said Syria has responded, but he did not say how,” one said. My dear Madame, you underestimate the quality of Syrian hummus. That mealy porridge they serve in Tel Aviv just can’t compare. Opposition MKs responded angrily on Tuesday to reports that Syria has drafted a document defining the boundaries of the Golan Heights it expects as part of a peace treaty, saying the Olmert government has no authority to strike a deal with Damascus. Reuters reported that Syria was waiting for Israel to reply to the document through Turkish mediators, and quoted Syrian sources as saying that the boundaries detailed in the document refer to six geographical locations. The Syrian demands include a part of Lake Kinneret’s northeast shoreline that is within Israel’s international border but was seized by Syria during the 1950s. Israel Beiteinu supports “speaking to the Syrians on the basis of ‘peace-for-peace.’ There’s no reason to give up the Golan Heights,” a party spokeswoman said on Tuesday. Both right-wing and left-wing politicians criticized the legitimacy of the Olmert government even discussing the details of a peace agreement with Syria. Likud MK Silvan Shalom said the government had no mandate to discuss the state’s borders. “The current government is doing everything in its power to tie the hands of the next government, which will be elected in February, and its actions will cause severe harm to national security. We shouldn’t cooperate with these attempts,” Shalom said. Meretz MK Zehava Gal-On said she agreed the Olmert government lacked of a mandate to negotiate with Syria. “Assad’s suggestion requires serious examination by the next elected government, which will have to negotiate the obvious price of peace for the Golan Heights. But this government has no mandate at all to promote diplomatic moves,” Gal-On said. Deputy Foreign Minister Majallie Whbee (Kadima) suggested that Assad declare what his country would give for the Golan Heights. “Assad should say what he is willing to give away before he presents a list of demands. To start with, Assad needs to cut Syria’s ties to Iran,” he said. I heard that levni is looking for a visa to Syria, after Alex report above. Geez, the next thing they’ll do is ban freedom of speech. the women smoke behind closed doors and not in front of their family members. but they can be just as bad often. 15% is nonsense. In the city, certainly it must be at least 75%. and I would say 90% of men in the city smoke. ‘Most’ syrian women don’t smoke, but quite a few smoke behind closed doors. Even the conservative ones. And for those who would like to know, I do smoke argileh, a lot, but I am not a woman and not a conservative. And Hummous makes me gasy. I don’t mind gay weathermen although I find them quite awkward. I also find the creative Syrian lingerie quite appealing. It’s amazing how many marriage proposals the shoe-throwing guy is getting from the Arab world and overseas. I think I might throw a shoe or two myself, if I ever got past the cavity check. Since you are in management, you probably do not do any C programming anymore and therefore … you are already retired from C… or an atheist Jew. I know you smoke Argeeleh … Zenobia, Innocent Criminal and I are apparently the only sane ones here. Sorry for all the typing Rumyal and I forced you to do yesterday morning (your time). It was an interesting discussion between you and Rumyal. Shoe throwing is not going to help you one iota! That photo is priceless. This man will fail the most lax vehicle pollution level test, let alone human-grade pollution. Jokes aside, I do not see the realization of the new law a reality. Too many Syrians smoke too much. You do not just ban smoking with a decree. There must be years of preparation starting at schools, media, and more. Your arguments were fantastic, and did make it very difficult for me. The sweat came from having a great difficulty supporting my belief, from self-questioning it again and again, and from trying to explain what I still believe wasn’t a very successful argument (on my part). My dear friend, I was just joking a bit. I hope you get well soon. Thinking about our discussion a little bit more, what is definitely true is that there has always been a lot of ambiuity in Israeli policy. Ambiguity is the hallmark of Israeli officialdom, to the point where you and I can’t tell (maybe nobody can tell) whether it’s the result of bumbling incompetence and political paralysis, or consistent planning. The truth is of course somewhere in the middle. Yedidi, despite the fact that you now live so far away, you give FAR too much credit to our politicians, and their “consistent” or inconsistent planning. From everything I’ve seen, and indeed studied, all indications lead me to believe Israel has had NO POLICY over the past 30 years, at least, if not more. We have not acted, we’ve only reacted. Even settlements, in our own twisted way of thinking, as been a reaction. I truly WISH we had had some sort of policy, some kind of plan. Even a bad one. That way, at least we could check ourselves, learn from mistakes and correct them. But we don’t, we didn’t, and at the rate we’re creating impotent political parties, with amateur and often incompetent leaders, we’re quite likely to continue along this “consistent” road also well into the future. But planning, ha! That fits more a joke on the Bazooka-bubble gum than Israeli politics… sadly enough. In my experience going to weddings I,ve seen women smoking where they usually wouldn,t …I was hoping they had more sense than their men folk..Someone noted that to get people to stop smoking you have to get them to be aware from an early age , therefore schools should be involved to promote anti smoking .I,ve seen school kids going to school in the early morning with a fag in their mouths! My husband is a smoker , and has been for years , when I ask him to stop , he says he will when hes “unstressed” So either Syria makes peace with Israel so we can all be “unstressed” or smoking will carry on unabated at least in our house! – The Lebanese government would give passports to Palestinian refugees so they can travel. My comment: no mention about the financial compensation, or the refugees in Syria. de définir les grandes lignes d’un règlement du problème des réfugiés palestiniens, notamment ceux établis au Liban. – Le gouvernement libanais devrait accorder aux réfugiés des passeports afin de faciliter leurs déplacements à l’étranger. – Les réfugiés devraient obtenir des permis de travail. – Les réfugiés devraient être répartis entre les États-Unis, le Canada, l’Australie et certains pays européens, tels que la Suède et la Norvège, et d’autres pays, dans des proportions qui devraient être définies avec les dirigeants de ces pays. Israël devrait accepter le retour de 12 000 réfugiés et le Liban devrait en accueillir 50 000.
pose : maintenir la crise actuelle en l’état, ou accepter la formule proposée » (par l’UE). « Les pays sondés pour accueillir des réfugiés palestiniens n’ont pas rejeté l’idée d’en accueillir un nombre restreint, d’autant qu’ils accordent l’hospitalité à des réfugiés d’autres pays », ajoutent les sources en question qui précisent que le projet européen n’a été élaboré qu’après que des dirigeants palestiniens eurent été consultés à ce propos. Les mêmes sources ajoutent qu’elles ne savent pas quelle serait la réaction du gouvernement libanais et si ce dernier pourrait accepter d’accueillir 50 000 réfugiés palestiniens, sans leur accorder la nationalité, d’autant que toutes les parties libanaises s’opposent, à l’unisson, à toute implantation des Palestiniens. En tout état de cause, l’année 2009 pourrait être marquée par des pourparlers intensifs au niveau des deux volets syrien et palestinien du processus de paix. Un accord entre Israël, la Syrie et l’Autorité palestinienne aboutirait automatiquement à une relance du volet libano-israélien, affirment les sources précitées qui indiquent que la réponse du nouveau président américain à l’initiative européenne devrait être annoncée en février prochain. Et ces sources de rappeler que lors d’un entretien téléphonique avec le président de l’Autorité palestinienne, Mahmoud Abbas, le président élu Obama avait souligné qu’il plaçait le processus de paix au Proche-Orient en tête de ses priorités. Just remember that “Isreal” is not only elected politicians and that planning is not usually the domain of politicians. When you look around you, I’m sure that you see a lot of artifacts which are the result of successful planning and execution. I DO NOT BELIVE THEY WILL EVER IMPLEMENT IT. LOOKAT THE SAFETY BELT IN THE CAR, MOST OF THE TIME THE DRIVERS JUST DRESS IT WITHOUT FIXING IT.ITS PLENTY OF LAWS, HERE IN SYRIA, NOT IMPLEMENTED. I TOOK HUNDREDS OF AIRPLANE IN MY LIFE? MANY DIFFERENT COMPANIES? AND BELIEVE ME, SYRIAN AIRLINE IS THE ONLY ONE WHERE CREW USED TO SMOKE IN THE TOILET.HABIBI, DO YOU REALLY BELIEVE THIS NEWS? I DO NOT BELIVE THEY WILL NEVER IMPLEMENT IT. LOOKAT THE SAFETY BELT IN THE CAR, MOST OF THE TIME THE DRIVERS JUST DRESS IT WITHOUT FIXING IT.ITS PLENTY OF LAWS, HERE IN SYRIA, NOT IMPLEMENTED. I TOOK HUNDREDS OF AIRPLANE IN MY LIFE? MANY DIFFERENT COMPANIES? AND BELIEVE ME, SYRIAN AIRLINE IS THE ONLY ONE WHERE CREW USED TO SMOKE IN THE TOILET.HABIBI, DO YOU REALLY BELIEVE THIS NEWS? Is it a coincidence that this is the first post on SC whose title in written in capitals? Do we smokers need to feel worried or discriminated against here? Israel has had NO POLICY over the past 30 years, at least, if not more. We have not acted, we’ve only reacted. Even settlements, in our own twisted way of thinking, as been a reaction. Of course Israel’s settlement policy has been a policy already before 1948. “You” had even settlements in Sinai and governmental plans of hugely increasing them before USA forced you to give Sinai back. Israel has been using settlements to get control of a larger area, covert military bases, as a source harm the local peoples life etc. Israel has always built settlements as an active tool for creating new facts on conquered land. That is an action not a reaction. Surely I agree with Shai that Israel on the ruling level has had NO real POLICY with peace and building relations with Palestinians and the region. The negotiations with Palestinians have been a farce and aimed only to satisfy western audience without no real aim to give up West Bank. No rational government invests and lets it people to invest billions on occupied area if it is going to give it up. After Oslo and Annapolis Israel has only increased the “facts creating policy”. By the way smoking and sun bathing make people look older . First, the government does have an interest in preventing illness and disease, because when people suffer from serious illnesses, such as cancer, they become a burden on society and the state. Second, while people may have a right to harm themselves, they have no right to cause harm or become a nuisance to others. If I choose not to smoke, I should not have to be forced to inhale your smoke in a public setting. You can choose to smoke in your own home without harming others, but when you’re smoking in public places you are infringing on the right of the non-smoker. About the government interfering because of health cost , that can be achieved by insurance company charging smokers more than non smokers , in addition to tobacco tax used for health care . How about sexual orientation ,Or high fat diets , the government might want to interfere in that , should that be OK. This is not a Syrian government invention. In Quebec we finally passed a similar law a couple of years ago that also made it impossible to smoke in public places and after considerable resistance, everyone got used to it and … what a difference! Ask Zenobia how she almost gave up on Syria and decided to go back to the United States after she realized that there was no way to escape being surrounded by smokers everywhere she went. I can’t believe I wrote the title of this post in capital letters! The past few years I learned to shut up and let smokers smoke. Although I was successful with younger friends who were starting to experiment with smoking, my efforts with established smokers were mostly useless. The best I could achieve was that when I was there, my friends would not smoke … same way they did not smoke when their parents were around. This is the same idea behind the Clean Development Mechanism (CDM) arrangement (the Kyoto Protocol) … it is easier and more efficient to work on the underdeveloped sources of pollution… the new polluters. And that’s the least I would hope to see out of this new law. No advertising, and a clear statement that smoking (at least outdoors) is against the law… it might make it less attractive for new smokers to continue smoking. I hope this law will be part of a wider initiative that includes educational components. I can’t imagine another product out there, of any sort whatsoever, anywhere in the world, that has a gigantic label on it saying “If you use this product you’re going to die!! !”, and yet, billions use it, every day, sometimes 15 times a day, their entire lives. Another amazing film (based on the true story), called “The Insider” (Russell Crowe, Al Pacino) came out in 1999 about a Vice President for R&D at Brown & Williamson (one of the tobacco giants) that turned whistle-blower, for the first time ever, about what really goes on in the cigarette industry. There, they call the cigarette a “delivery system”, intended to deliver nicotine directly to the brain. It’s effects, are what I wrote up above. Hospitalist. 2007;11(8) ©2007 John Wiley & Sons, Inc.
Nobody thought it was possible. Could all indoor workplaces in Ireland—including pubs—be made smoke-free? Now, a law enacted in 2004 is seen as a triumph for public health policy worldwide. Smoking kills 438,000 people a year in the United States, and 8.6 million have a serious smoking-related illness. Research shows many outpatient physicians do not judge it worthwhile to talk with their patients about quitting smoking because they assume they will have no effect. The assumption is that even if patients quit, they will relapse. Yet ample evidence suggests hospitalists can have a positive effect by intervening during a patient’s hospital visit. Data also show that an individual will relapse an average of seven times before being able to take the step for the long term. Relapse is a part of the process, each time teaching an individual something about his or her motivation and behavior. “Doctors who address smoking with patients can double or even triple the chances of their quitting,” says Shawn Ralston, MD, pediatric hospitalist at Presbyterian Hospital in Albuquerque, N.M. A few pointed questions and a show of compassion to the patient in the hospital could make a world of difference. Stephen Liu, MD, MPH, a hospitalist and an assistant program director at Dartmouth-Hitchcock Medical Center (DHMC) in Lebanon, N.H., has been interested in smoking-cessation interventions since his residency in DHMC’s Leadership Preventive Medicine Residency Program in 2003, where he worked on improving care for pneumonia patients. His efforts took off as a result of the Centers for Medicare and Medicaid Services (CMS) pay-for-performance measures, which made smoking-cessation counseling a key component of admission and discharge documentation for a number of disease states. The approach used with adult patients at DHMC is the brainchild of Colleen Warren, a registered nurse on the medicine unit on which Dr. Liu worked. In January 2006, DHMC was awarded a grant from the New Hampshire Department of Health and Human Services to standardize the treatment of hospitalized smokers. This includes conducting tobacco screening, assessing a patient’s readiness to quit, providing brief counseling, documenting the status and stage of change into the electronic medical record, and referring the patient to community resources upon discharge. The funding allowed the institution to support Warren and Dr. Liu as they coordinated the team and its work. These efforts, including counseling, nicotine replacement therapy, and cessation medications, are also available free to DHMC employees. DHMC is participating in the CMS demonstration project, in which the hospital publicly reports performance measures for several conditions on the CMS Web site. In addition, many more performance measures are publicly reported on the DHMC quality-measures Web site. Although the team initially targeted the intervention to performance measures related to pneumonia and heart failure hospitalizations, they decided to offer interventions to all patients admitted to the hospital. Of these patients, about 20% are smokers, Dr. Liu says. Because financial support wasn’t available at first and staff time was voluntary, the work was more difficult. Data from a six-month pilot intervention on two inpatient floors at DHMC showed patient assessments increased from 2% to 85%. In addition, the percentage of eligible heart failure and pneumonia patients receiving smoking cessation advice or counseling prior to discharge has risen from 30% before 2005 to 80% to 90%. “We have found that hospitalization is a golden opportunity to address smoking cessation in patients in that they become acutely aware of how the smoking has affected their health,” says Dr. Liu. Because patients frequently go without smoking for several days while hospitalized, they learn they can live without smoking and feel much better. “The key for our kind of intervention is not only assessing it and addressing it while they are hospitalized, but making sure that we link them to resources after they leave,” Dr. Liu says. Those resources include telephone quit lines or local support groups and/or local cessation clinics. Counseling patients can be personally and professionally fulfilling, says Dr. Liu. He recalls a 50-year-old man—a lifelong smoker—admitted for pancreatitis. The day he was discharged, he showed Dr. Liu a hospital-produced packet of information. The patient said he had been reading it during his stay, decided he was motivated to quit, and had called the quit line. Arrange for a follow-up visit. A slightly longer counseling session with a motivated patient means a provider can explore whether they know their triggers for smoking, such as stress, alcohol use, or being around other smokers, and help the patient develop a proactive plan for when they are re-exposed to triggers upon discharge. In Dr. Ralston’s case, her research and the research of others inspired her to begin counseling the parents of hospitalized children. [3-4] She was conducting research on respiratory illness, specifically bronchiolitis—the most common reason children are hospitalized. She noticed the vast majority of children had had secondary smoke exposure. The work of C. Andrew Aligne, MD, formerly in the department of general pediatrics at the University of Rochester (N.Y.) Medical Center, inspired her. [5-6] His analyses of attributable risk data revealed that the major and preventable cause of death in children is secondary smoke from parents. But the issue really crystallized for Dr. Ralston when she encountered the work of Jonathan Winickoff, MD, MPH, an assistant professor of pediatrics at Harvard Medical School and a researcher with the Massachusetts General Hospital Center for Child and Adolescent Health Policy in Boston. Another researcher who inspired Dr. Ralston was William R. Miller, PhD, who created the motivational interviewing model. Motivational interviewing is used with individuals to elicit and examine the ambivalence surrounding their unhealthy behaviors. Dr. Miller, retiring this year from the University of New Mexico (Albuquerque), began his work in the area of alcohol abuse. He and his colleagues have increasingly used motivational interviewing in other areas of addiction. Dr. Ralston says what she has learned from motivational interviewing—and how she counsels parents of hospitalized children differently because of it—primarily pertains to her willingness to talk to people about a difficult subject. Instead of bombarding parents with facts about how smoking is bad for their children—which they already believe but don’t want to talk about—she learned to focus on the parents’ needs instead of the effects on the child. When approaching a parent to offer help, says Dr. Ralston, “I will lead by acknowledging that the experience the parent is having is extremely stressful. Then, after addressing the primary illness of the child and what the plan is for that, I say, ‘I see [from our records] that you are smoking. Have you tried to quit? Are you interested in quitting now? What might I be able to do to help you?’ If there is an opening, then I’ll go into more extensive counseling. “You don’t need all the data behind you. I use my expertise more to motivate pediatricians, not the parents.” Another tack she takes to motivate pediatricians to empathically address smoking is to ask them to think of something they do that they know is bad for them but that they continue to do. Look at what you are willing to do, advises Dr. Ralston. “If that is a brief message and then a referral to a quit line, that’s fabulous,” she says. “You still might double the quit rate.” Given the temporal nature of the hospitalist-patient relationship, there may be a good number of ways hospitalists could effect change by offering a few encouraging words. Koh HK, Joossens LX, Connolly GN. Making smoking history worldwide. N Engl J Med. 2007 Apr 12;356(15):1496-1498. Centers for Disease Control and Prevention. Targeting Tobacco Use: The Nation’s Leading Cause of Preventable Death, 2007. Available at http://www.cdc.gov/Tobacco/basic_information/00_pdfs/AAGTobacco2007.pdf. Last accessed June 18, 2007. Ralston S, Kellett N, Williams RL, et al. Practice-based assessment of tobacco usage in southwestern primary care patients: a Research Involving Outpatient Settings Network (RIOS Net) study. J Am Board Fam Med. 2007;20(2):174-180. Ralston S, Mahshid R. The pediatric hospitalist and the smoking parent. Pediatric Research Day 2006. Available at http://hsc.unm.edu/pedsresearch/ORAL%20PRESENTATIONS.htm Albuquerque: Office of Research and Creative Endeavors, Department of Pediatrics, University of New Mexico Health Sciences Center; 2006. Last accessed June 18, 2007. Aligne CA, Stoddard JJ. Tobacco and children. An economic evaluation of the medical effects of parental smoking. Arch Pediatr Adolesc Med. 1997 Jul;151(7):648-653. Erratum in: Arch Pediatr Adolesc Med 1997 Oct;151(10):988. Comment in: Arch Pediatr Adolesc Med. 1997 Dec;151(12):1269. Arch Pediatr Adolesc Med. 2000 Aug;154(8):850. Leonard K, Mosquera M, Aligne CA. Pediatrics in the community: Taking a collective breath to help children who have asthma. Pediatr Rev. 2007;28:152-153. Winickoff JP, Hillis VJ, Palfrey JS, et al. A smoking cessation intervention for parents of children who are hospitalized for respiratory illness: the stop tobacco outreach program. Pediatrics. 2003 Jan;111(1):140-145. Why now?? … there is one month left anyway. US Secretary of State Condoleezza Rice announced on Thursday the resignation of David Welch, top Middle East diplomat, who mediated the Israeli-Palestinian negotiations and the US normalization process with Libya. A career diplomat, Welch, 55, became the first US assistant secretary of state to resign in the transition of a US administration. By the way Alex I understand what Zenobia went through when she was i Syria , I was there in 2003 and had to sit at the end of the table with the children which i enjoyed to stay away from the smokers in our company , I dealt with it , I did not complain, I could have even gone home . People drink and drive and kill people , spouses abuse their spouse after heavy drinking , it affects more people and alcoholics are a dangerous to others , I do not see you or others calling for the government to ban Alcohol , could that be because Alcohol is a drug and we like people to get numb and forget their sad lives . government and healthcare providers should provide help to people who want to help themselves not forcing help down their throats. Recently in Atlantic city they wanted to implement a ban on smoking in the casinos , they had to resend that law because of fear from the down turn in the economy and the chance that this law will push the Casinos into bankruptcy. Syria can not and should not make it easier for people to go to Lebanon than to go to Syria and baning smoking could do that. Remember that the government is not banning smoking; it is merely controlling its use. Specifically, it is banning smoking in public places, because when you smoke in public places you are, by definition, affecting others. As for alcohol, the government does interfere in its usage also. In the US, for example, you have to obtain a license to sell alcohol, you may not sell it to people under 21, and you are not allowed to use it out in the streets, in public beaches, or in public parks. Moreover, in many states alcohol cannot be sold after 1:30 am and we know how strict the government has become on drinking and driving. Likewise, with respect to tobacco, the government is introducing limits on its use and consumption, and is not forbidding people from using it. We can not make meat eaters vegetarians over night , doing that and mandating restaurants having only vegetarian food will empty these restaurants , so will baning Tobacco in restaurants and public places it will only empty these restaurants of tourists and customers.and will drive the Syrian economy down hill , have a special places for smokers and for non smokers so they all will come out and eat , like in many states in the US. But I support adding taxes on tobacco products … in addition to to banning smoking in public places. 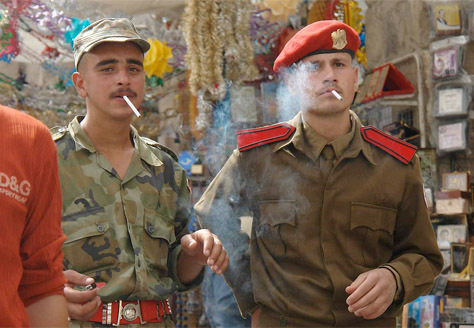 Will soldiers be asked to not smoke? Finland has a new law proposal for increasing the tobacco laws and now under heavy debate. The proposal includes that shops must keep tobacco products in a a not transparent box and the shop can give the customer a list of available products but the customer is not allowed to take the paper with him/her. Selling tobacco to minors will be punishable by prison (in Finland causing death for example in traffic or some sexual crimes do not “cause” in most cases prison time). It will be criminal for a minor to have cigarettes in his/her pocket. Limits for smoking in private cars. No candies which “resemble” smoking (liquorice pipes). Etc. “They” are gradually shifting the tobacco products to level with have with illegal narcotics. If we watch the health consequences in Finland of air “pollution” tobacco is certainly not the most serious. Living in a crowded city causes also burden to the lungs. In the seventies there were studies which claimed that living in a centre of a Finnish town is equal to over 10 daily cigarettes for non smokers. In Finland the problem especially in wintertime is the fine stone dust which the anti-skid tires of cars loose from the asphalt (causes asbestosis like consequences) and the numerous private fire places which burn wood in relative low temperatures which together in windless circumstances cause that the air quality drops dangerously low. And in Finland the towns are relative small and air is clean compared to more crowded countries and less developed countries. In Finland alcohol and overweight are much more dangerous health risks than tobacco (about 35 percent of Finns smoke). I have never heard that somebody causes troubles under the influence of nicotine, but I can daily read from newspapers stories about crimes made under the influence of alcohol. My opinion is that this smoking banning has reached its limits (banning smoking in closed public places like restaurants etc is understandable but not outdoors) and is nearing a level where the “majority” terrorises a relative big minority. Sure smoking is dangerous and everybody in developed countries knows that. But so is dangerous drinking soft drinks and eating candies, not to mention junk food. Alcohol is dangerous. Drinking to much fruit juices destroy the dental enamel. Etc. If the society takes to “demanding” attitude with the citizens health issues where are the limits? Will health “jihads /holy wars” against alcohol, hamburgers, sugar products be the next? Should we ban internet and computer games because they cause that some people move to little which lowers their potential life time expectation. Sure they could be argued with same or even better health argumentation as with tobacco. I am cool. It is not about you smoking it is about you as a doctor talking about the matter in this manner. The idea being that the people who possess knowledge and are in a position to share it and to influence the process have more of an obligation. Addiction is a disease and nicotine addiction has wide ranging consequences. Most people are not educated enough about those consequences, or about the telltale signs of addiction or the process of recovering from this addiction. Even the denial, “oh I can stop any time I want” or ” I am not addicted, I just enjoy smoking” are typical statements of addicts. It is not a matter of free choice here and it is affecting people individually and as a society. I think that the Northern European countries are specially plagued by alcoholism and its consequences. So are France and Germany in term of the cost on healthcare that it is putting on the country and in term of the sociological problems that it is creating. But there are politics there too. One of the most remarkable incidents in the history of science and politics happened in Munich in the early years of the 20th century. Kaiser Wilhelm visited Munich where the famous Emil Kraeplin a neuropsychiatrist worked and had been the first to identify, classify diseases due to the effect of alcoholism on the nervous system, and to speak strongly against alcohol. The Beer barons managed to prevent Kraeplin from being accepted for an audience with the Kaiser to push an agenda for restricitng alcohol production and usage. There were several scientific movements in Switzerland at the end of the 19th century into the 20th which strongly attempted to call for a ban on alcohol but they never took hold enough because no government supported them. The history of the Prohibition in the U.S. is also very instructive. I think it makes perfect sense to restrict alcohol as much as other drugs- Legistlation restricting the areas where people can smoke in the U.S. turned out to be the single biggest behavior modification program in the history of the world. But it did happen. There are now also programs aiming to improve diet and prevent obesity starting in the schools and the fight against obesity is picking up momentum in some of the Western countries that are affected. Recently, most dramatically, India declared that Diabetes has become an epidemic since the country has become more prosperous. And public health measures have started to be studied. Now to the bigger question: Are all those steps contrary to human freedom. It seems to me that since man started living in society, certain behaviors have had to be restricted…for the good of the individual and of the society- “you cannot go and kill someone who has raped your daughter which would be a normal wish under certain circumstances, one has to settle for the process of the law”. Ethicists are always standing in the grey zone trying to highlight the complexities of the trade-offs. I think that the Northern European countries are specially plagued by alcoholism and its consequences. That is mostly an urban legend Alia. In Nordic countries (all a round the world) we have the tendency of drinking much in a short time but relative rarely. That historical behaviour is basically caused by the requirements set by the cold temperature. In minus 20 Celsius you can’t run drunken all the time around like you can do in less colder areas, so drinking must be planned and “effective”. For this “climate” reason to be very drunk has not been a social tabu here, when it is in central and southern Europe. During the past decades also the drinking habits in Northern countries have become closer to those of Central Europe’s. More wine and beer instead of vodka. Surely we have alcoholics here, but I suppose the average livers are in better shape here than they are in Germany and France. We had in Finland during the 20’s and 30’s a no alcohol laws as there were in USA. The joy when it was ended was unseen. Still in Finland and Sweden one can buy alcohol only from special by the state owned regulated shops besides the restaurants. Not so freely as in the rest of “civilized” world. My point is that all living is dangerous and basically what ever you do you have to pay a price. Is using alcohol worse than eating legal perspiration drugs which affect to one’s psyche (which “they” sell in increasing amounts to an ever growing share of the population). Surely we need information about the consequences of using tobacco, alcohol, medicines, industrial foods etc, but I do not want live in a “Taleban” society where a bunch of fanatical health “experts” replace the religious “function” of (former and future) Afghanistan or present Saudi Arabia. Alia a considerable amount of health professionals smoke, drink and eat junk food flavoured with chemicals of which effects we and they have no clue. I know several doctors and nurses who smoke. One hospital here even tried to order that their personnel is not allowed to smoke on free time away from the hospital (not to give a bad example as they said). I call that totalitarian behaviour. Well luckily they had to stop their “fascist” demands.